The first ever virtual health club offering professionally-supervised virtual group coaching for your self-care. We teach you to heal yourself and your family by participating in our weekly health and wellness episodes where our experts guide you in our expertise; Naturopathic and Functional Medicine and Holistic health and nutrition coaching. Rely on us to show you the next steps in your health care journey. We believe self-care is truly primary care. Virtual Health Club is ideal for those dedicated to improving their own health and self-care using effective and enlightened self-care techniques. If you are a beginner or a health professional yourself, we offer the level that’s appropriate for you. We believe that you are your best doctor, and the doctor of the future and we are trained to guide you into being. We also welcome coaches who are looking for more education into Naturopathic and Functional Medicine. Lastly, we welcome medical practitioners looking for resources for themselves and their patients in the art and science of holistic chronic disease prevention, treatment and wellness. We feel certain that by welcome all levels into our community we will serve everyone where they need to be, as well as provide opportunities for experts to coach your own episodes. Scroll through the events - Register for 1 session or a monthly subscription. Don’t forget to use the promo code to share with others, and pay yourself 20% back, and your friends save too. Every other week we offer live, non-recorded live coaching sessions where you can call in to have your own questions answered. 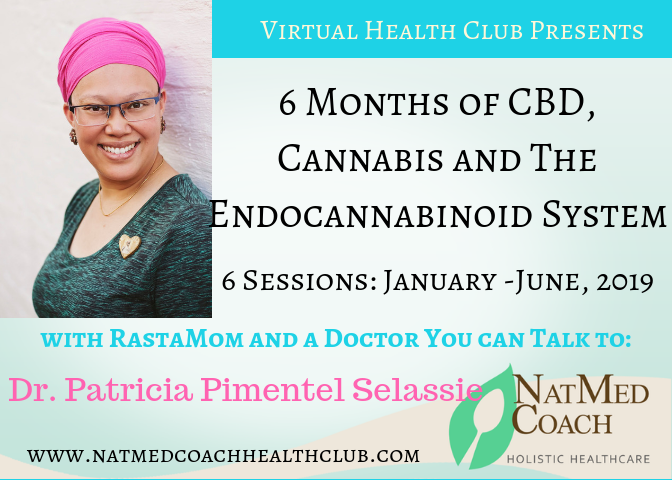 RastaMom and A Doctor You Can Talk To, Dr. Patricia Pimentel Selassie ND gears up for 6 presentations on CBD, Cannabis and the Endocannabinoid System. February 19, 2019 : What and Who has Endocannabinoid (CBD) Deficiency? March 16, 2019: CBD: Is it Appropriate to Give to Your Child? 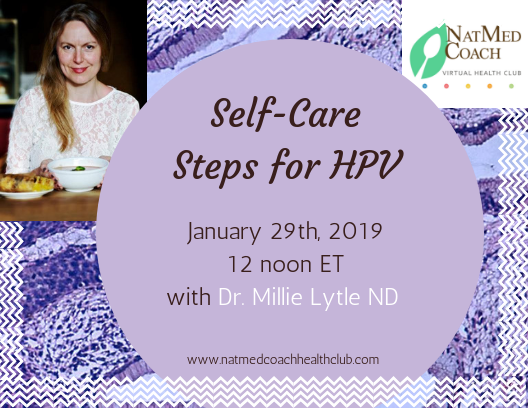 Dr Millie and other Nat Med Coaches take your live questions on nutrition, lab work, lifestyle, accountability, naturopathic and functional medicine, mentorship, self-care, self-healing, stress reduction, recipe tips and more. Drop in if you have a question or a tip to offer. 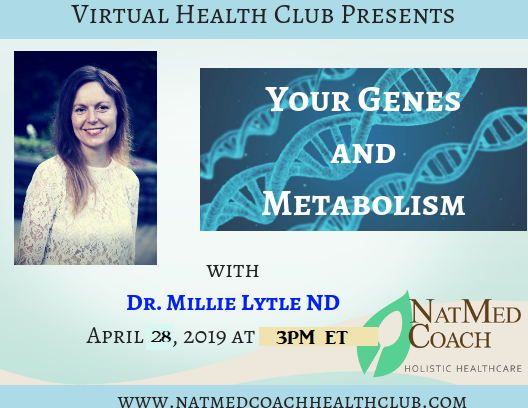 In this episode of Virtual Health Club, Dr. Millie will explore several genes responsible for weight gain, a high BMI, stubborn weight loss, insulin resistance, blood sugar resistance and leptein insensitivity. Our CBD expert is back to educate us on how to use cannabis for mood disorders, mental health issues and to improve your mood. This episode is appropriate to patients, self-care enthusiasts and health care providers wanting to learn more about the role CBD and its benefits for mental health disorders. Dr Millie will be running this session. Dr. Millie has a background in clinical psychology, cognitive behavioral therapy (CBT) and psychodynamic psychotherapy. She is also a certified hypnotherapist and regression therapist. Join her as she fills in for Vanessa Samora on the 2nd of 4 part series on Natural Mental Health Perspectives. Do you struggle to feel healthy, strong and vibrant mentally? Sure, stress and lack of sleep are likely causes, but it could also be your gut. We will explore how foods and the health of your intestinal lining can directly affect your mental health by creating or exacerbating psycho-emotional states such as a general sense of malaise, depression and anxiety. Do you struggle with your thoughts. Do your thoughts turn negative when you are left alone? Have you tried to meditate but failed? Do you think you could have more confidence and get more accomplished if you had better self-confidence? In this online seminar, Coach Allie will discuss how to travel safer. We will discuss tips and strategies for staying on track with a healthy lifestyle while on vacation. How to stay on track with your meal plan while travelling. Judy DiMaggio is a Certified Holistic Health Coach. After spending her entire working life in the corporate world up until four years ago, she decided to become a health coach to fulfill her passion of holistic health. She works with clients to improve their health through diet and lifestyle changes. She specializes in food allergies as she has had to deal with her own and that is what led her to holistic health. Judy received her training at the Integrative Institute of Nutrition in New York City. She is certified by the American Association of Drugless Practitioners, the International Association of Health Coaches and has taken Advanced Business Training at IIN. In addition to food allergies, she also works with clients experiencing weight challenges. She is a native New Yorker. Our CBD expert is back for a 6th episode of CBD and health club. This time she’s going to educate us on how the endocannabinoid system interacts with other drugs and medications. How to use the entourage effect to support you and your clients. This episode is appropriate to patients, self-care enthusiasts and health care providers wanting to learn more about combining therapies with CBD and cannabis. Are you tired in the morning? Do you experience a second wind at night? Do you feel like your body can’t calm down, or that your mind is racing all the time? Are you an adrenaline junkie? All these situations can indicate one common root - Adrenal Fatigue. 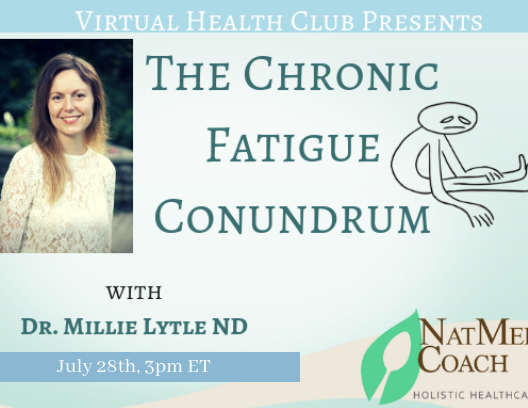 In this episode of Virtual Health Club, Dr. Millie will explore reasons behind fatigue. What is Adrenal Fatigue - Because it’s not a disease. In this online workshop, Coach Allie will discuss the importance of supplementation. In this online workshop, Coach Allie will discuss the daily process of toxifying and detoxifying. We are celebrating Virtual Health Club’s first birthday by celebrating you - and teaching your to celebrate yourself in your mind, body and spirit. 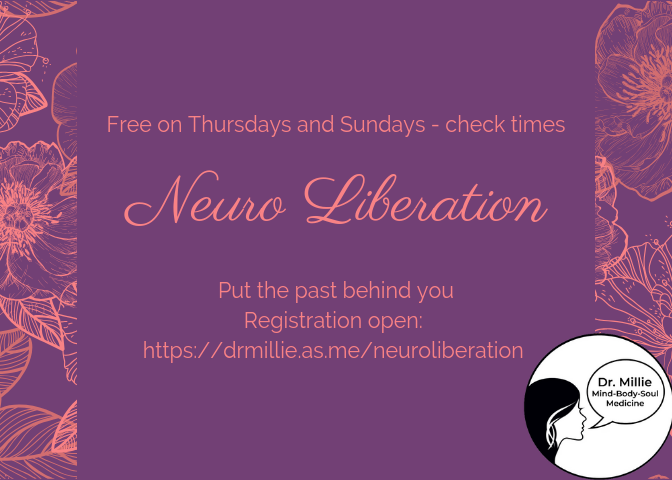 Join us for some neurocoaching brain plasticity rewiring. Happy Birthday to Us - This episode is free - get the whole month at 50% off ! Our CBD expert is back schooling what plants to take that will also stimulate the endocannabinoids system. What is the entourage effect and how can knowledge of it help you. This episode is appropriate to patients, self-care enthusiasts and health care providers wanting to learn more about the role CBD and its plants mimickers. Dr Millie will be running this live-meditation session. Dr. Millie has a background in clinical psychology, cognitive behavioral therapy (CBT) and psychodynamic psychotherapy. She is also a certified hypnotherapist and regression therapist. Join her as she fills in for Vanessa Samora on the first of 4 part series on Natural Mental Health Perspectives, rescheduled from March 19th. We will workshop mind-body skills, tapping, mindfulness, meditation, and neuroplasticity. You will experience the benefits of techniques. This series is ideal for seekers looking to improve their mental health self care, looking for effective strategies to improve your mood, and for wellness providers interested in learning other perspectives on mental health. We look forward to seeing you there! You may not know the term Oral Allergy Syndrome but it is a common food-related allergy that develops in adults. OAS is connected to environmental allergies, such as hay fever. When a person has oral allergy syndrome, certain fresh fruits, nuts, and vegetables that contain traces of pollen trigger reactions in the mouth producing irritation. This talk is appropriate for heath coaches, health enthusiasts and those determined to remove excess sugar from their day and want to understand how to identify it and learn better alternatives. Low grade infections and imbalances of the microbiome are regarded by the naturopathic medicine community as a perpetuating root cause of chronic symptoms such as yeast infections, urinary tract infections, bacterial vaginosis, mold sensitivities, food allergies periodental disease, bad breath, constipation, pain, fatigue, depression, obesity, fibromylagia, chronic fatigue, skin outbreaks and even autoimmune diseases. In this episode of Virtual Heatlh Club, Dr. Millie will present this possible root cause of many chronic diseases, the research and the clinical applications. CBD: Is it Appropriate to Give to Your Child? Our CBD expert is back schooling on how to be confident in giving or recommending CBD oil to children. 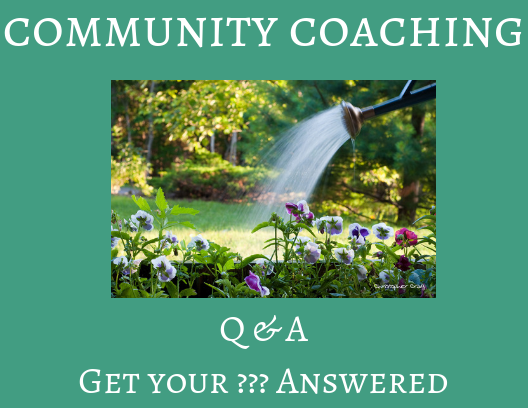 Get your questions answered from a knowledgeable naturopathic doctor and Rasta Mom. Is there an ethical issue with dosing your child with CBD? If you are pregnant or nursing, is there a danger in dosing with CBD? What are some childhood conditions that could be helped by CBD? What’s appropriate dosing for your child? This episode is suitable for self-care enthusiasts, health practitioners and health coaches wanting to learn the science and practice of safe and therapeutic CBD recommendations. Register for Virtual Health Club to get this access to health and life coaching. They say snacking is good for you - up to a point - do you know where the good ends and the bad begins? Has food marketing gotten you confused as to what’s healthy and what’s not? Do you want more ideas for healthy snacks at work, or to put in lunches and to sustain your busy day? In this episode of health club Allie will discuss common snacks for on-the-go, show typical vs "healthy" vs best choices and she will demo how make your own granola that passes as breakfast and a snack! This talk is appropriate for heath coaches, health enthusiasts and those determined to learn more about food myths and truths. The difference between marketing healthy food and real health food. Tickets: $29 (includes on-going virtual health club) - cancel anytime. Martin Ehrlich is a licensed board-certified physician of Internal Medicine with over 30 years of experience as a clinician-educator. He attended the University of Rochester and received his medical degree from Columbia University. He completed residency training in Internal Medicine at Harlem Hospital where he was Chief Resident and obtained a Master’s Degree in Public Health from Columbia. He was on the faculty of Columbia, Albert Einstein and Mount Sinai and taught communication skills, psychosocial aspects of medicine and Integrative Medicine. This year he completed a fellowship in Hospice and Palliative Medicine. His practice will focus on Primary Care, Internal and Integrative Medicine, as well as supportive care for patients with chronic and serious illnesses. Aware of the limitations of contemporary medicine he was an early adapter of Integrative Medicine. In his practice, he incorporates nutrition, botanical medicine, homeopathy, functional medicine and Mindfulness Based Stress Reduction. He completed fellowship training in Integrative Medicine at Andrew Weil’s program at The University of Arizona and is certified in Acupuncture and Medical Marijuana. In 2003, he joined the the Beth Israel Center for Health and Healing and served as Medical Director from 2008 to 2016. Tools to help communicate not only physical symptoms but also feelings and concerns including fears and goals to their health care provider. Enable patients and family to ask questions, express needs and emotions and advocate to become full partners in the therapeutic alliance. This episode is ideal for any patient wanting to be empowered in their doctor's office and receive tools to make use of during your doctor's appointments. What and Who has Endocannabinoid (CBD) Deficiency? Our CBD expert is back schooling on how to confident understanding, taking or recommending CBD oil health diagnoses. Get your most clinical questions answered. If deficiency is not an issue, could you be insufficient in Endocannabinoids? How do you dose for Clinical Endocannabinoid Deficiency? This episode is appropriate for those considering CBD oil therapy for a chronic condition. This episode is also excellent for practitioners considering recommending CBD to their patients. To tune into this episode - Register for Virtual Health Club - Receive 1 month free by using code FIRST-FREE HERE We will not charge your credit card unless you decide to stay for a second month - you may quit any time but why would you want to? Dr Millie and other Nat Med Coaches take your live questions on nutrition, lab work, lifestyle, schedule, accountability, naturopathic and functional medicine, mentorship, self-care, self-healing, stress reduction, recipe tips and more. Drop in if you have a question or a tip to offer. Become aware of allergy-free substitutions on the supermarket shelves. Feed yourself with love, in love, through love - and share it with the one you love - or feed it to all your loves. This talk is appropriate for heath coaches, health enthusiasts and those determined to spice it up in the kitchen! 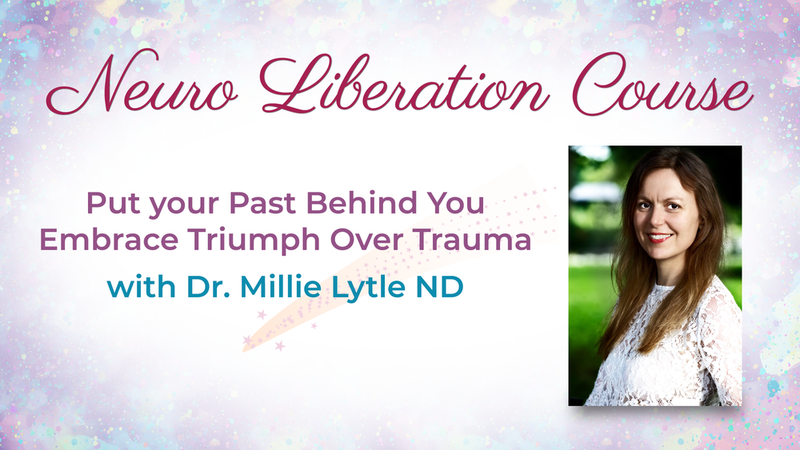 Dr. Millie Lytle ND has also worked with numerous individuals to cure their abnormal cells as well as having treated herself successfully using an all-natural approach. THC might have a different benefit for pain and why you should be aware of both. To get a synopsis on what the studies are telling us. Join Certified Functional Medicine Practitioner Nina Yunovich for this new-format online cooking class allows you to shop for the recipe ingredients before the class - and follow along on your own computer with the instructor. 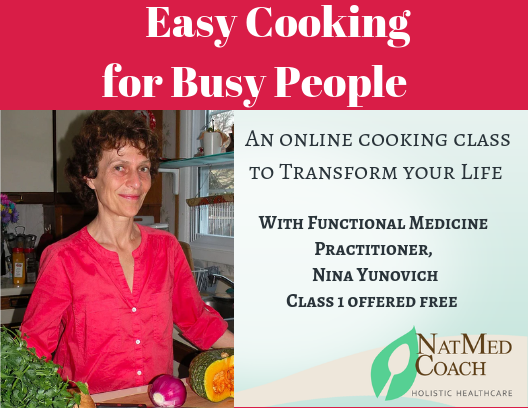 Functional Medicine Practitioner and Cooking instructor Nina Yunovich will show her passion for nourishing meals that magically appear while you're doing other things. The time you do spend will be nourishing and even therapeutic! Tools: For this class, it's best if you have a slow cooker. Ingredients and recipes: These will be sent in advance before the class so you click and order or shop for the required ingredients. Don't know how to order groceries online? We will send you our favorite links in plenty of time so you will have the ingredients on hand for the time of Nina's class. Flor will be showcasing a special energy technique to reduce anxiety instantly and feel better in your mind and emotions! This online course is appropriate for heath coaches, health enthusiasts and those determined to heal yourself! 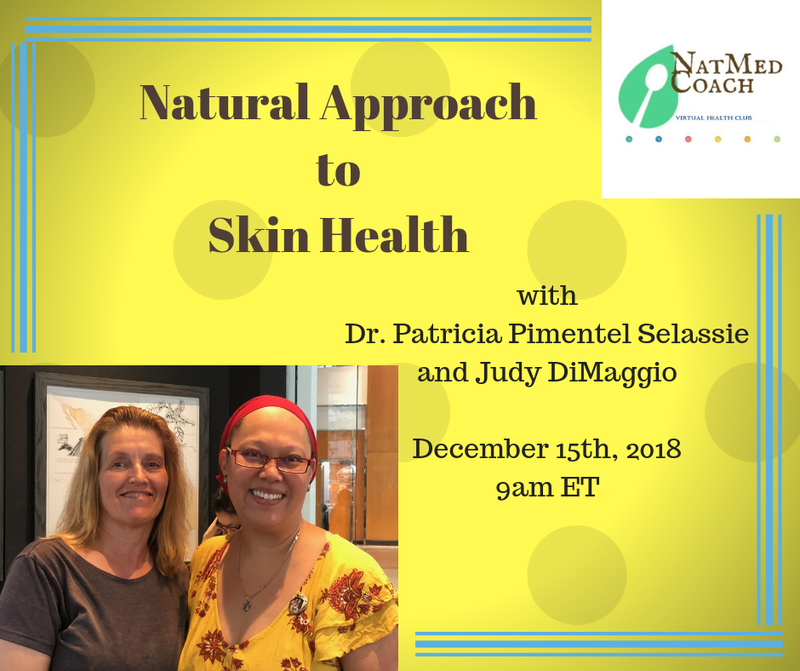 Learn in depth naturopathic knowledge that can result in beautiful skin! This session is conducted in a small group coaching session over zoom.